Ford has expanded the versatile all-new Fiesta line-up with two bold new colour-contrast models, which will be the new Fiesta ST-Line Red and Black models. Based on the sporty Fiesta ST-Line variant that has accounted for almost one in five Fiesta sales in 2018 to-date, the new Fiesta ST-Line Red and Black models feature unique, distinctive exterior and interior details that help drivers stand out from the crowd and further emphasise the model’s dynamic, Ford Performance-inspired styling. The Fiesta ST-Line Red and Black are powered by Ford’s 140 PS 1.0-litre EcoBoost petrol engine, and feature sports suspension for a responsive, engaging and fun-to-drive experience. 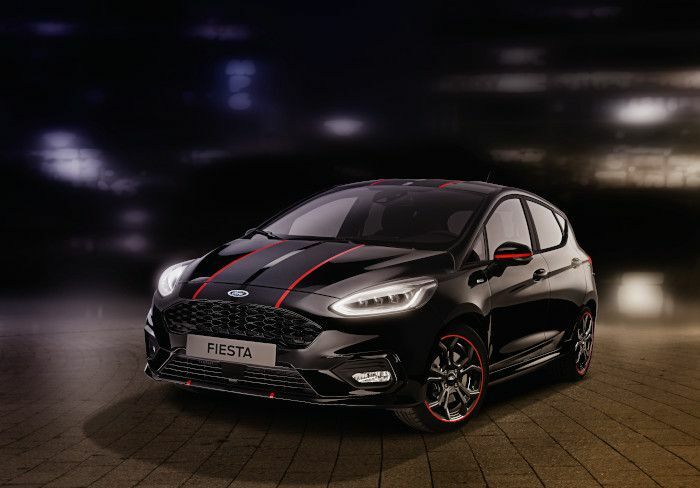 “The head-turning style of our new Fiesta ST-Line Red and Black models emphasises Fiesta’s dynamic character and lets the driver’s personality shine through,” said Amko Leenarts, director, Design, Ford of Europe. “High-series vehicles including ST-Line models made up 70 per cent of our passenger car sales in Europe in August – and we’re finding more than ever that customers want to make a statement with the cars that they drive.” Ford introduced the ST-Line model range in 2016, designed for customers who aspire to the sporty image of Ford Performance models – but do not require the full performance delivered by Ford Performance optimised engines and chassis. 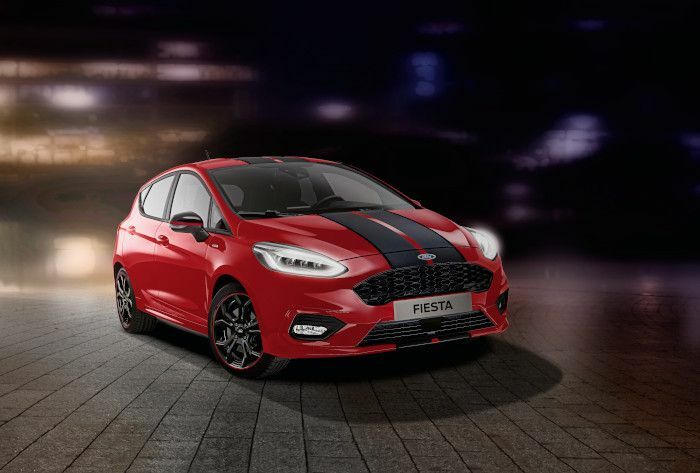 The new Fiesta ST-Line Red features a Race Red exterior enhanced with matte black stripes that are edged in high-gloss black, and extend from the roof, though the bonnet to the lower front spoiler lip. The Fiesta ST-Line Black features a Panther Black exterior, and matte black stripes highlighted with high-gloss red edges. Both eye-catching models feature an over-sized, body-color rear spoiler, distinctive Panther Black 17-inch alloy wheels with red rims, and black mirror caps bisected by a horizontal red stripe. The interior continues the contrast color theme. Red accents feature for the partial leather sports seats, door pulls, central air-vent register surround and passenger-side deco-spear. Red-stitching enhances the flat-bottomed leather steering wheel, gear lever gaiter, handbrake lever and gaiter, floor mats and door interiors. 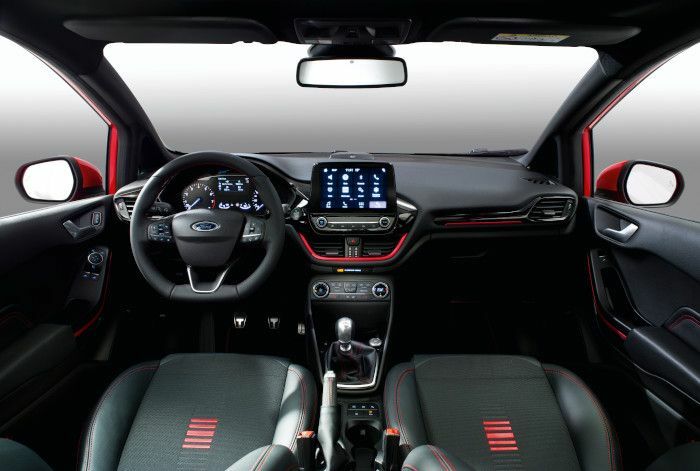 Ford’s available SYNC 3 connectivity and entertainment system is compatible with Apple CarPlay and Android Auto™, and when specified enables Fiesta ST-Line Red and Black drivers to control audio, navigation and connected smartphones using voice commands and an 8-inch color touchscreen. SYNC 3 also is compatible with high-resolution audio file formats, and an available 675-watt B&O Sound System delivers a 360-degree premium audio experience using ten speakers, including a boot-mounted subwoofer and a central mid-range speaker on top of the instrument panel. Comfort, convenience and safety features delivered as standard include halogen projector headlights with auto lighting, LED daytime running lights, and LED rear lights; front fog lights incorporating static cornering lights; Lane-Keeping Aid; Speed Limiter and Hill Start Assist. Further available advanced driver assistance technologies include Pre-Collision Assist with Pedestrian Detection, Traffic Sign Recognition, Adaptive Cruise Control and Blind Spot Information System. Ford’s powerful and fuel-efficient multi-award-winning 140 PS 1.0-litre EcoBoost engine and low-friction six-speed manual gearbox combination delivers from 4.9 l/100 km fuel efficiency and from 112 g/km CO2 emissions. The new Ford Fiesta ST-Line Red and Black models are available to order in selected European markets now. Ford also offers individualisation options including contrasting roof and door mirror caps for the all-new Fiesta line-up that includes the stylish Fiesta Titanium, upscale Fiesta Vignale, the Fiesta Active SUV-inspired crossover, and the Ford Performance-developed all-new Fiesta ST.